Mirette approached us with a very specific card design in mind. She needed a pocket fold card to hold her inserts. 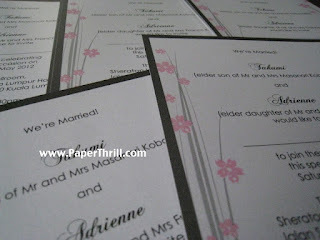 Her main invitation is printed and layered on the base pocket card as she preferred the added depth of a double layered card. A luxurious chocolate brown ribbon belly band wraps around the card. We used a pearlescent textured card for the pocket to give it a more refined and classy feel. We love our dainty daisy collection of wedding invitation cards, and decided to tweak the design for a thank-you card as well. 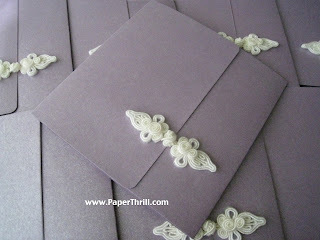 The thank-you greeting is handstamped on the cover, and dotted with pink pearl beads. We rounded the corners of the card to give it a softer look. The signature ribbon bow is tied at the side. Message may be printed on a separate inlay inside, on a smooth pearlescent paper. The 'thank-you' greeting may be replaced with other greetings, and converted to an invitation card instead. Mark approached us with a design in mind. 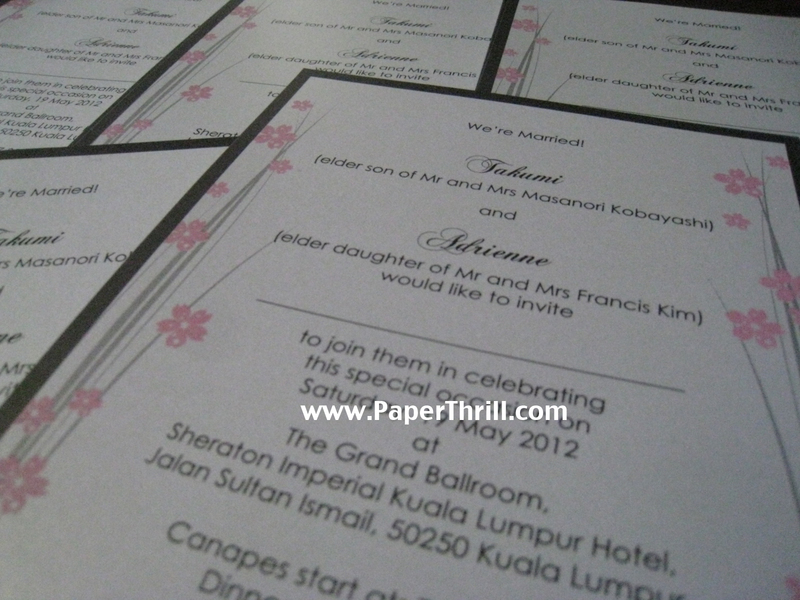 The initial draft was this Triangle-cut gate fold wedding invitation card. 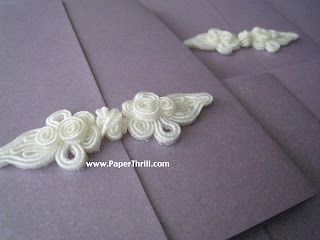 However, after tweaking the design a little, the end result was this beautiful subtly textured wedding invitation. 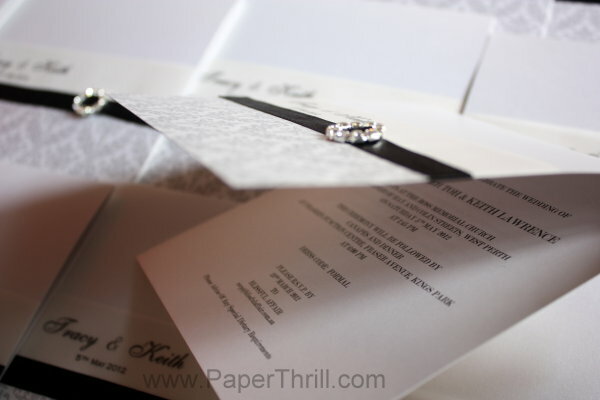 Instead of a gate-fold card, we glued down the pointy edges to convert into a pocket wrap. To give depth to the invitation card, we used a shimmery textured cardstock instead of a smooth one. Tracy's wedding invitation card comes with a damask print on both the front and back of the card. A vellum band with black ribbon wraps the front flap. A luxurious diamante buckle adorns the front of the card, giving it an extra touch of glamour. 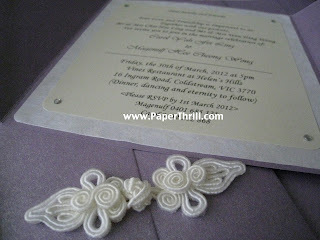 Another variation to our very popular Oriental Knot Wedding Invitation. Carol's theme was purple and we change the stockcard to a lovely lilac and kept the chinese knot to a simple ivory. 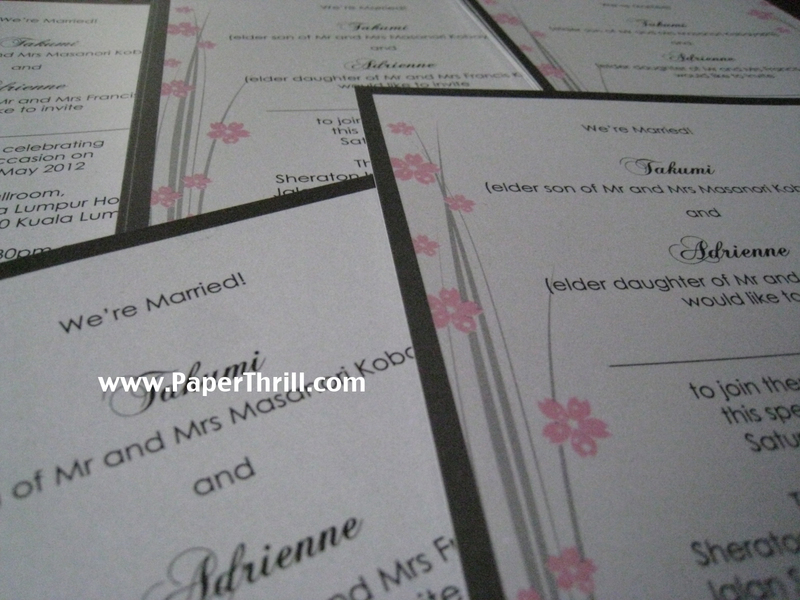 We also had the card size change to a square with the folds overlapping for a more elegant feel. This collection of birthday cards feature a beautiful bouquet of blue flowers. We layered a rustic-textured recycled paper together with a green floral patterned paper, and the combination compliments the bouquet of flowers perfectly.